When managing devices in your organization, you want to create a group of settings that are applied to different device groups. For example, you have several device groups. For GroupA, you want to assign a specific set of settings. For GroupB, you want to assign a different set of settings. You also want a simple view of the settings you can configure. You can complete this task using Administrative Templates in Microsoft Intune. The administrative templates include hundreds of settings that control features in Internet Explorer, Microsoft Office programs, remote desktop, access to OneDrive, use a picture password or PIN to sign in, and more. These templates are similar to group policy (GPO) settings in Active Directory (AD), and are ADMX-backed settings (opens another Docs site) that use XML. But, the templates in Intune are 100% cloud-based. They offer a more simple and straight-forward way to configure the settings, and find the settings you want. Administrative Templates are built in to Intune, and don't require any customizations, including using OMA-URI. As part of your mobile device management (MDM) solution, use these template settings as a one-stop shop to manage your Windows 10 devices. 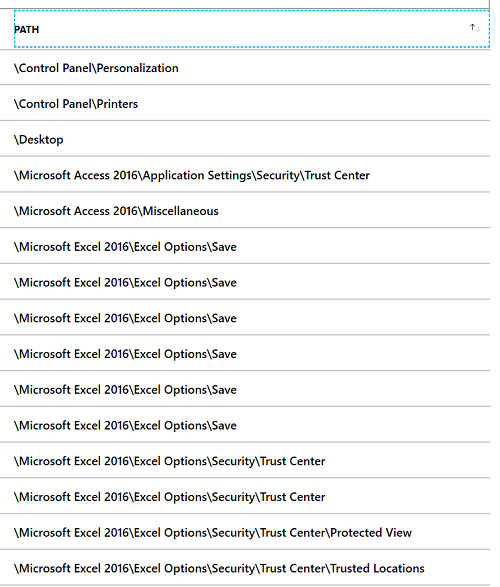 This article lists the steps to create a template for Windows 10 devices, and shows how to filter all the available settings in Microsoft Intune. When you create the template, it creates a device configuration profile. You can then assign or deploy this profile to Windows 10 devices in your organization. Name: Enter a name for the profile. Profile type: Select Administrative Templates (Preview). Select any setting. For example, select Allow file downloads. A detailed description of the setting is shown. Choose to Enable, Disable, or leave the setting as Not configured (default). The detailed description also explains what happens when you choose Enable, Disable, or Not configured. Use the VBA Macro Notification Settings setting to handle VBA macros in different Microsoft Office programs, including Word and Excel. Use the Allow file downloads setting to allow or prevent downloads from Internet Explorer. Use the Require a password when a computer wakes (plugged in) setting to prompt users for a password when the devices wakes from sleep mode. Use the Download unsigned ActiveX controls setting to block users from downloading unsigned ActiveX controls from Internet Explorer. Use the Turn off System Restore setting to allow or prevent users from running a system restore on the device. In another example, search for microsoft word. You see all the settings you can set for the Microsoft Word program. Search for explorer to see all the Internet Explorer settings you can add to your template. This feature uses Windows policy CSPs (opens another Docs site). The CSPs work on different editions of Windows, such as Home, Professional, Enterprise, and so on. To see if a CSP works on a specific edition, go to Windows policy CSPs (opens another Docs site). The template is created, but it's not doing anything yet. Next, assign the template, also called a profile and monitor its status.